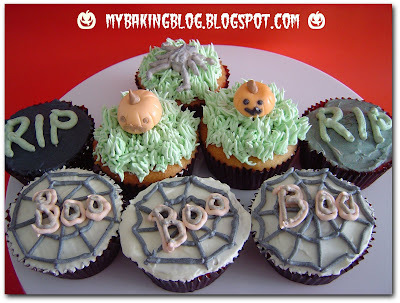 My Baking Blog: HAPPY HALLOWEEN! I have never celebrated Halloween in my life. The closest I got was many years back, when I bought a pack of ghost shaped chocolates from Marks & Spencer and gave them to my colleagues. Ok, that doesn't count as celebration. In my world, Halloween is non-existent. My knowledge only goes as far as knowing that pumpkins are always been carved, pictures of cats, witches, ghosts, spiders are always associated with Halloween....that's all. But I could not miss joining SSB's October Bake of Spooktacular Halloween Cupcakes, because I did not have to have a celebration to eat the cupcakes. The cupcakes came out very nice (as with all previous SSB's chosen recipes). Everything about the cupcake was just nice - the sweetness, the amount of butter, the soft texture. I frosted them using Swiss Meringue Buttercream (SMBC)...instead of my usual icing-sugar-added-to-butter buttercream. Goodness, I didn't know I was missing out this much before! I had always wondered how bakeries can make their buttercream so light and yet not overly sweet. Now I finally know. I'll never go back to using buttercream made from only butter and icing sugar. Though I had good fun frosting the cupcakes, you can see that creativity is not something I am born with. It's the first time I work with black colouring, and though I seemed to have added so much colour, I still could not get the shade that I wanted. I eventually decided not to add too much colour, which is why the spider (if you could make it out as a spider!) and the spider webs are not black. I had planned to decorate 2 'eyeball' cupcakes with white frosting background and some red jelly lines as red veins. But I completely forgottten about them, until I realised that dear and I had eaten 2 unfrosted cupcakes..oops. The "BOO" words were supposed to be in darker colours, but I had added a lot of colouring yet the colours remained pale, so I let them be. Dear was the first to try to unfrosted cupcakes, thumbs up! He tried them again after they were frosted, just as good! He couldn't exactly work against his conscience and gave me thumbs up for my designs, which hardly look spooky. In fact, they look comical. Mum tried the cupcakes and love them too. Not too many comments from her on the piping too, other than "is that meant to be a spider?" Haha! - first time I use black colour (I did not know I have to add so much!). My cream was still not black, I stopped adding colour when it was dark grey. - first time I pipe grass. Obviously I need practice. My grass looks like an abandoned patch in the forest. - first time I pipe a rose. I used the remaining frosting to try piping a buttercream rose, based on the videos I have watched on Youtube. The first attempt was ok, though not exactly nice. The subsequent ones were disastrous and the piping was not stiff enough. I spent a lot of time on the frosting and it was tiring but was good practice. All the cupcakes are already in our stomachs by the time you see this post! The great recipe can be found in my Recipe Blog or SSB's website. True, everything about the cupcake was just nice! Wow, your first Halloween! These look fabulous. Hi Brimmer, wow your cupcakes are brilliant - well done!! Black food colouring does seem to take vast amounts colour I agree. love the little pumpkins - adorable! I had fun too !! Loved the cupcakes, definately a keeper!! Your cupcakes look spooky !! well done !! Your cupcakes are so cute, love the decoration! Hope you will join us in our next bake. Ciao ! I love your cupcakes ! I just got a ka too! And I'd love to take a decorating class but there aren't any here ! Just like you, my first Halloween celebration but I think it was fun participating. Your cupcakes look great. those little pumpkins are cute.